There’s nothing quite as satisfying as kicking back in a tall Adirondack chair to watch the sunset, enjoy a cocktail or two, or take a refreshing catnap. Their extra large armrests are wide enough to balance a drink or a book, and your weight is more evenly distributed, leaving you refreshed after sitting. 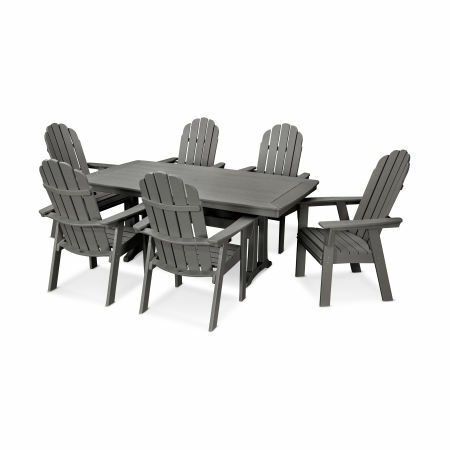 Due to their versatility, POLYWOOD® Adirondack chairs are incredibly popular. 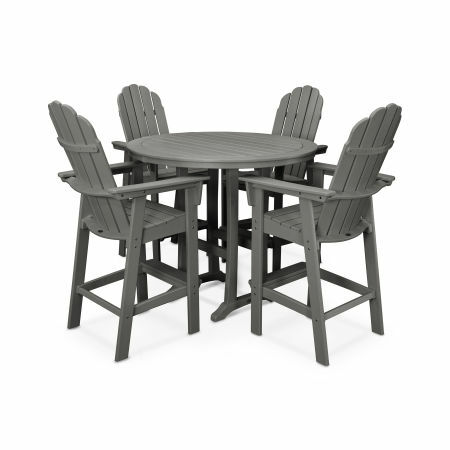 You can find tall Adirondacks for counters and bars, Adirondack dining chairs, benches, and options with ottomans. Their timeless style lends itself well to any outdoor setting, be it a backyard barbeque or an elegant dinner under the stars. With our large variety of options, the possibilities for your outdoor living spaces are endless. 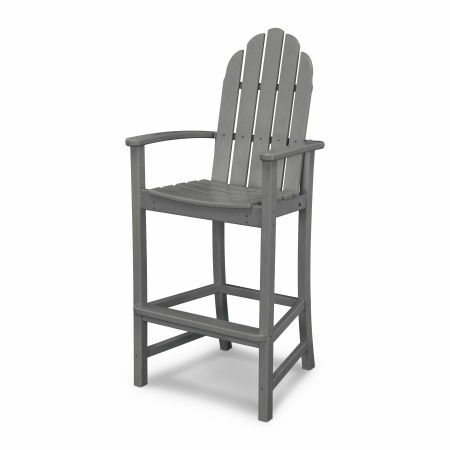 POLYWOOD® Tall Adirondack Chairs are made from sturdy, high-density polyethylene (HDPE) plastic lumber that is formulated to withstand the elements. Rest assured you’ll never have to worry about a sharp splinter snagging your clothing or body: unlike natural wood, genuine POLYWOOD® lumber does not rot, splinter, chip, crack, or peel. Mainly derived from post-consumer bottle waste, such as milk jugs,that has been cleaned and decontaminated, POLYWOOD® lumber is eco-friendly and specifically built to withstand damaging substances like oil, rain, snow, and sea spray. It’s manufactured with UV-inhibited pigment systems to ensure that your Adirondack chairs maintain their vibrant colors. Additionally, insect infestation will never be a problem, and you’ll never have to deal with structural damage from termites or other outdoor critters. Did we mention that our tall Adirondack chairs are incredibly easy to clean? All you need is soap and water and your chair will look just like they did the day you purchased them. POLYWOOD® high-density plastic Adirondack Chairs never require any painting, waterproofing, or staining, which means more time for relaxing. Enjoying the beauty of natural surroundings from the comfort of your own backyard, a beach, a lake, or another peaceful location is one of life’s greatest joys. Unfortunately, at times the view can be less than perfect when you’re sitting close to the ground on a towel or in a regular Adirondack chair. POLYWOOD® Tall Adirondack Chairs are the perfect accompaniment to a relaxing afternoon outside. From a higher vantage point, you’ll be able to enjoy the view you’ve always wanted of Mother Nature’s masterpiece. No matter what your outdoor color scheme, there’s an Adirondack chair in a tone to complement it perfectly. Our chairs come in a wide variety of fade-resistant colors, ranging from vibrant hues like Tangerine, Sunset Red, and Aruba, to natural shades including Mahogany, Sand, and Teak. Light stable pigments and UV inhibitors and stabilizers are evenly distributed throughout POLYWOOD® lumber to protect your investment from damaging UV rays and harsh sunlight, allowing them to retain their beauty for years to come. Having trouble choosing which color would go best with your outdoor decor? Reach out to our Customer Experience Team to request samples of your favorite hues and determine which shade is the perfect fit for your color theme. Tall Adirondack chairs are ideal for a seating arrangement that requires a higher chair, like sitting at a counter or bar. Unlike stools that become uncomfortable over time or wooden bar-height chairs that are susceptible to the elements, POLYWOOD® Tall Adirondack Chairs are comfy and durable. If you’re planning on hosting full meals on a table outside, try the Classic Adirondack Casual Dining Chair or the Quattro Adirondack Dining Chair for comfort without sacrificing style. If you’re looking for something that pairs better with a bar or a counter, a tall chair like our Vineyard Adirondack Swivel Counter Chair in Vintage Finish will hit the mark. We also offer Tall Adirondack Rocking Chairs perfect for relaxing on a porch on a lazy summer day. If you want to up the luxury factor, try one of our cushions made from Sunbrella® upholstery fabric. Built to withstand environmental stressors but made with comfort in mind, these cushions are available in a variety of attractive shades to complement your tall Adirondack chair. Choose from the simple seat cushion that covers just the bottom of the chair or a full cushion for additional back support. If you enjoy napping in your Adirondack, try a headrest pillow. 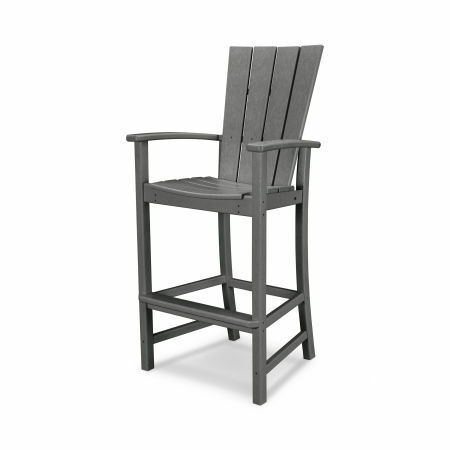 Expect compliments and excitement when your guests see what’s in store for them, seated on a luxurious POLYWOOD® Adirondack Chair and enjoying your company. As one of the most trusted brands in outdoor furniture, you can’t go wrong with POLYWOOD®.